The spectacular semi precious gemstones used in the one of a kind MOTHER NATURE’S FIREWORKS handmade necklace look like brilliant sprays of starburst fireworks. Although the gemstone is called starburst jasper (also chrysanthemum jasper and spider jasper), it is actually not a jasper at all but a type of rhyolite formed during volcanic activity. The star patterns are large crystals that were created during the slow cooling of lava. 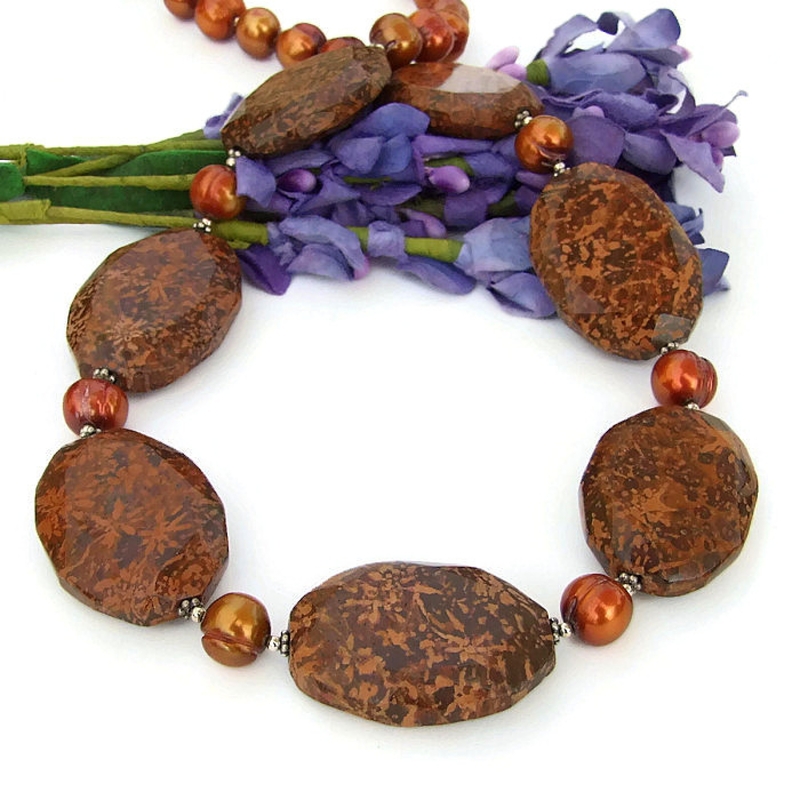 Each of the seven gemstones used in the artisan necklace is covered in starburst patterns, front and back, contrasting exquisitely against a darker background in various shades of brown. 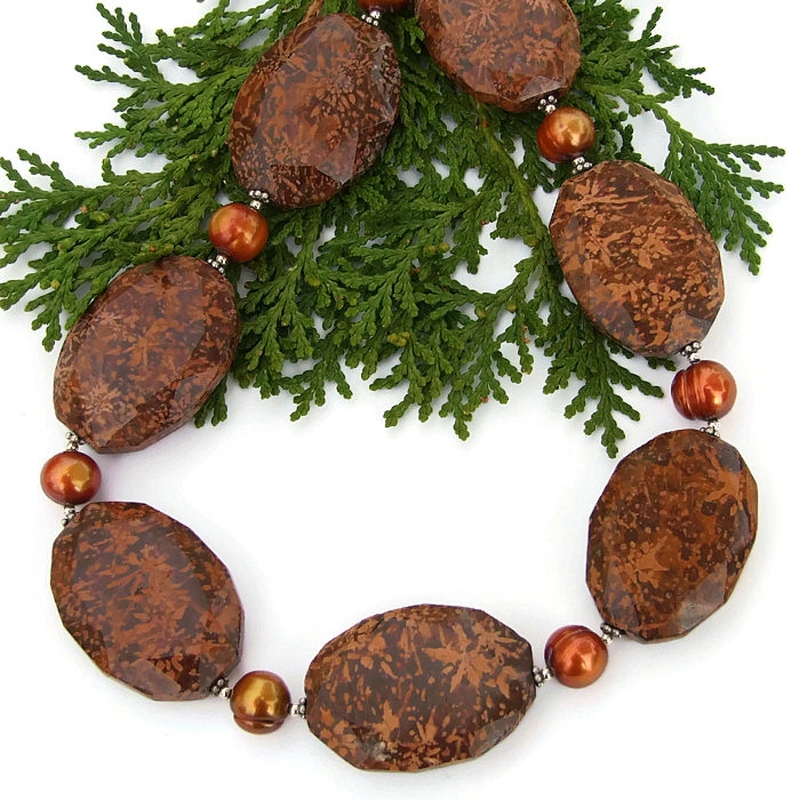 To add even more beauty, each piece of the somewhat chunky, flattened jasper is large faceted on the edges and has a high, glossy shine, perfect to catch and reflect the light. Sterling silver daisy spacers frame each end of the jasper. An eye-catching necklace, indeed! 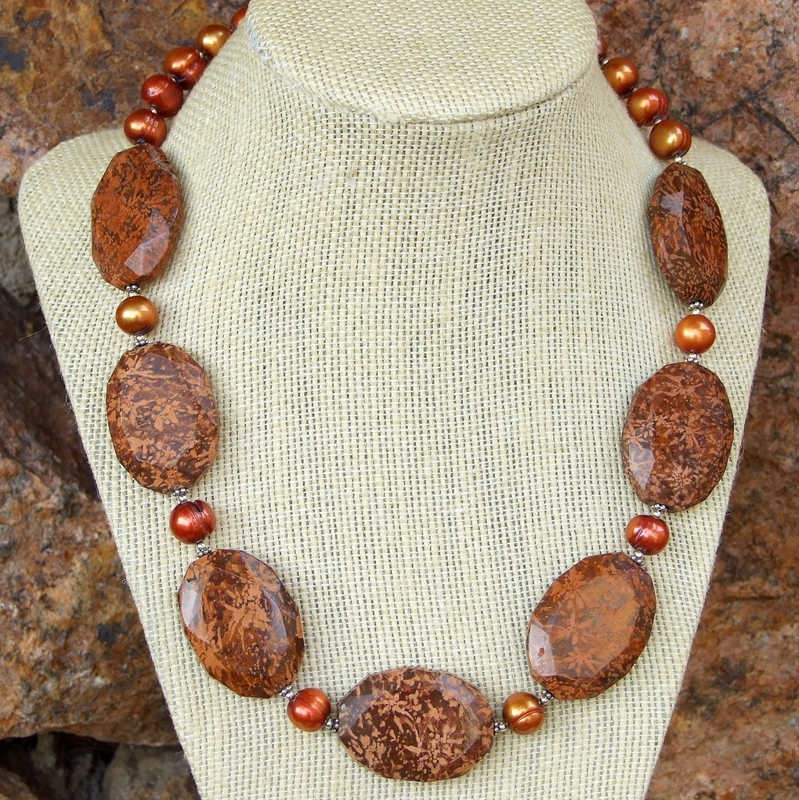 To add more than a touch of ovely glow to the necklace and to complement the colors of the starburst jasper perfectly, freshwater potato pearls separate each piece of starburst jasper and finish the back of the necklace. 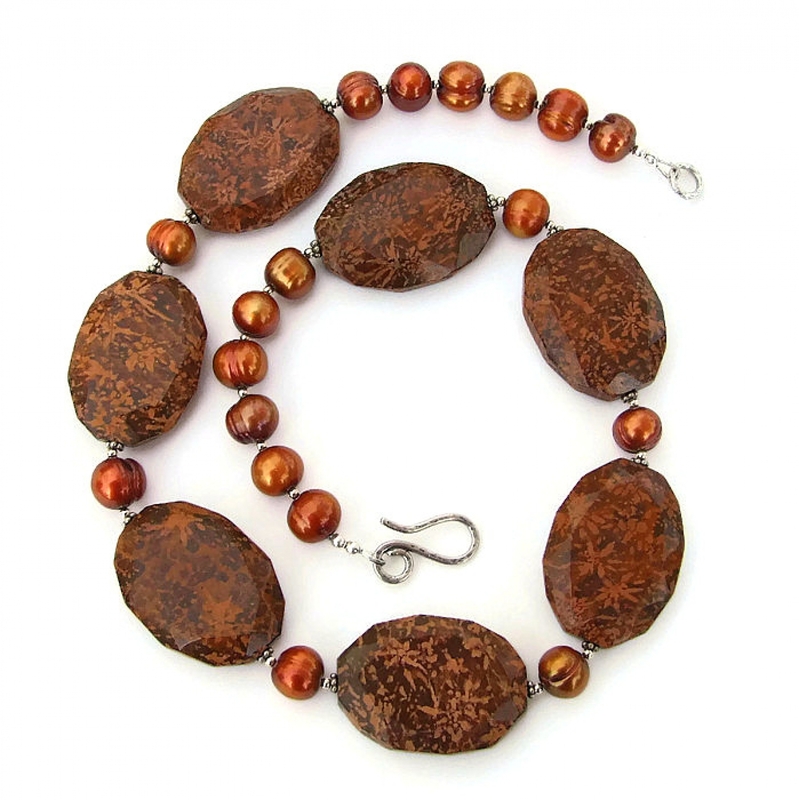 The warm, coppery color of the pearls range from a more golden shades to some a more orange-y look. 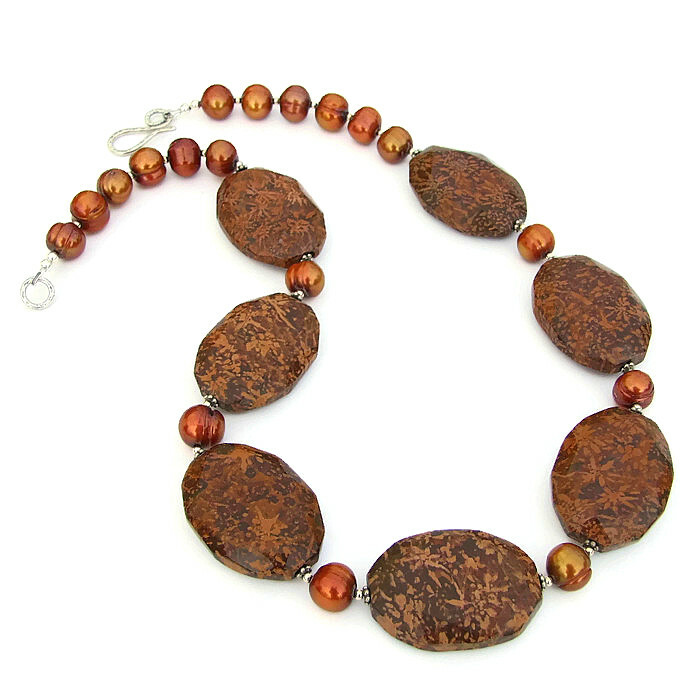 They are called potato pearls since they are not perfectly round, most are more oblong, and some have ridges, adding wonderful texture to the necklace design. A hammered sterling silver hook clasp adds an elegant finish. 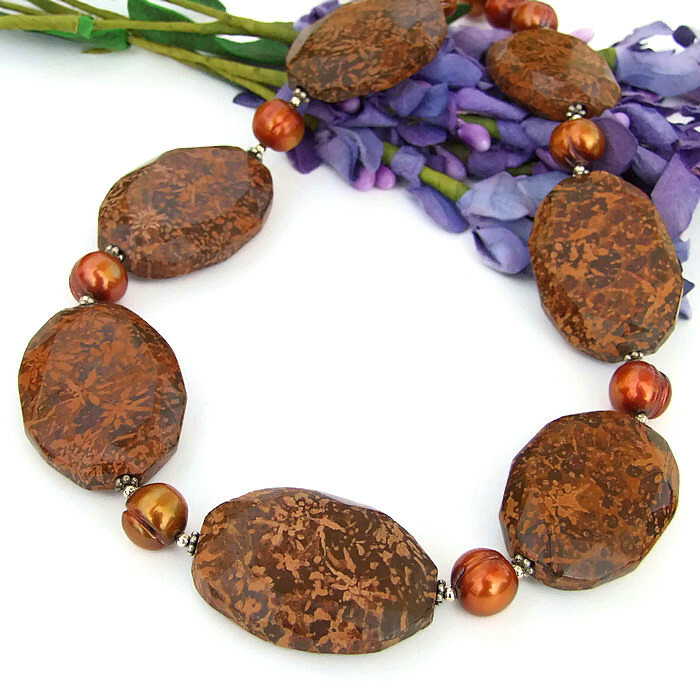 Created for the woman who loves unique gemstone and artisan handmade jewelry, the MOTHER NATURE’S FIREWORKS necklace was carefully designed and created by Catherine of Shadow Dog Designs. 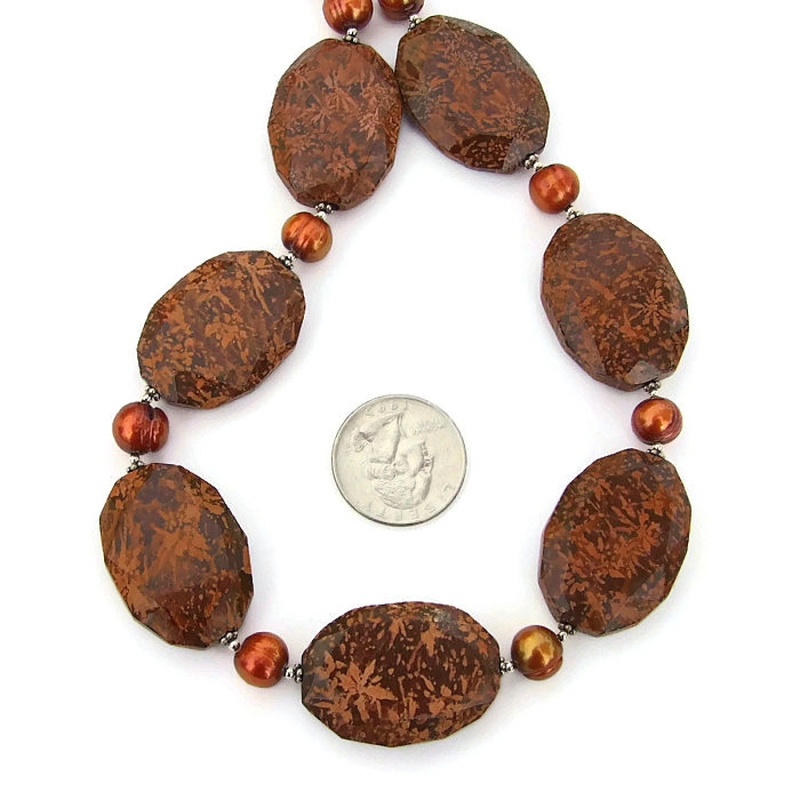 For a better understanding of the relative size of the starburst jasper and pearls used to create the MOTHER NATURE’S FIREWORKS one of a kind necklace, please be sure to check out photo #5 for a size comparison with a quarter. Starburst jasper (rhyolite) is known as a stone of harmonious transformation and change. Pearls are used to spread loving vibrations; they promote sincerity, truth and loyalty. Silver is a metal of love and healing; it is a mirror to the soul, helping us to see ourselves as others see us. The MOTHER NATURE’S FIREWORKS handmade necklace was carefully designed and handmade in a dog friendly, smoke free studio. The necklace will come with two informational drop tags: one with the piece's name; the other lists the materials used in the necklace and the language of the stones and metals. It will be carefully packed in an organza jewelry bag, perfect for gift giving to a loved one . . . or to yourself!